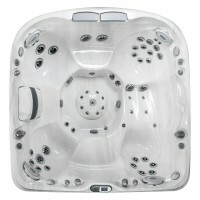 You'll love the J-425TM hot tub, made perfectly to fit just where you want it. Come home, relax and let the unique PowerPro® jets massage away all the tension that’s built up during the day. The J-470TM is a 6-7 person spa which has everything you need and expect from a large hot tub.Comfort comes in every size with seats in a variety of depths in the J-470TM. The seats are moulded to support the body and are designed to also give easy access to the foot well for increased relaxation for the perfect foot massage after a hard day. 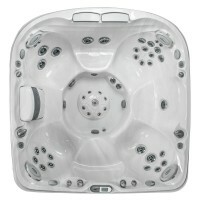 Highly effective neck jets and five of the vigorous Jacuzzi® PowerPro® FX2 jets are featured in this large hot tub delivering relaxation and rejuvenation.In this 6-7 person spa, give in to the luxury of Jacuzzi® hydrotherapy, cocooned in a world of cascading waterfalls and warm jet streams. The 39 PowerPro® jets produce virtually any massage type, from deeply invigorating to tension-relieving. There are five therapy seats in the J-470TM hot tub, each one designed to provide a targeted hydromassage for specific muscle groups. DESIGNER WITH OPEN SEATING.. The J-480TM is a 6 person hot tub with an innovative design which, with its curved and asymmetrical lines present a fresh spa silhouette unlike any other. The WaterColourTM feature is incorporated on the raised back and reproduces the effect of a real glistening waterfall full of light and colour. This luxury hot tub is an absolute must for any garden design with its sleek look and advanced hydrotherapy features, ready to make any garden instantly look better with its presence.This 6 person hot tub is great for families or friends and will transform the way you relax at home. Come home after a long day and sink into this most wonderful luxury hot tub. Getting away from the everyday has never been so easy. LARGE DESIGNER WITH LOUNGE SEAT..